First of all, I did finish two more of the polychrome scarves, for a total of 6 so far. I had them photographed last week in a studio setting so I would have good photos for the advertising and poster of the show I have coming up with 2 other women (early June, Winthrop Gallery). While working on these, I was getting increasingly frustrated by trying to use my little loom (a “Baby Mac”, Macomber model CP folding portable) for serious work. It is great for taking to workshops, fits in the back of my Honda CR-V, and it actually works great. But the treadles are small and spaced close together, it does have a tendency to have the tie-up hooks pop off on a regular basis, and this time around one of the folding struts folded up on me and I didn’t figure out why the tension was so far off on one side until it was too late. I thought I had just done a poor job putting the warp on. So I was thinking to myself, what I need is a 32″ Macomber to devote to narrower projects like scarves, towels, etc. But I know they are hard to find, or if you do find one it is way across the country and the seller is unwilling to ship. Nonetheless, I looked on Craig’s List that afternoon and one had been listed in Kingston, WA the day before! And we were leaving for a trip to Seattle in just a few days. Contacted the seller, talked to Rick who was amenable and so we took the truck instead of the Honda. 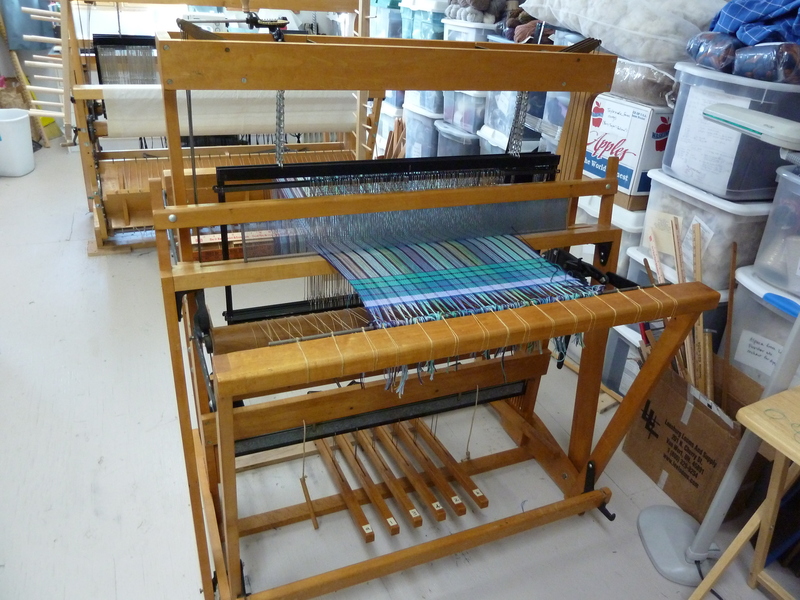 Last Sunday we took the ferry over to Kingston and I came back with a new loom. It is in wonderful shape, just needed some dusting and lubricating. 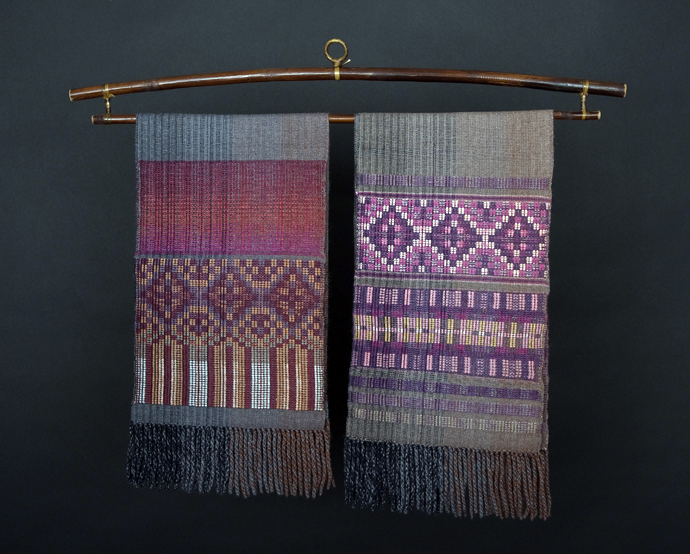 The woman’s parents were the weavers – they bought it used in the 1980’s. Her Dad had passed away and her mom is 92 and suffering dementia, so couldn’t really tell her anything about it. 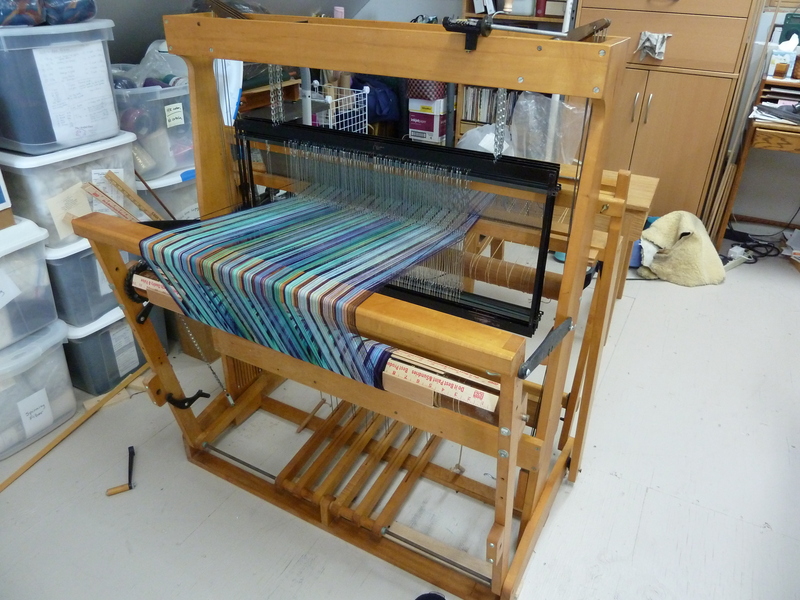 When we got home early last week, I contacted Sarah of the Macomber Looms and Me blog. She lives in York, Maine and is a rep for Macomber. I gave her the serial number and she went by the company and found out this loom was built in May 1961. When I can afford it, I will order 4 more ad-a-harness units to bring it up to an 8-harness loom. Do I “need” this loom? No. But it was a great deal and just had that “meant to be” feel. I like to set up for a particular kind of project and then just keep tieing on new warps, avoiding having to re-sley the reed and re-thread the heddles every time. This way I can have multiple projects going! 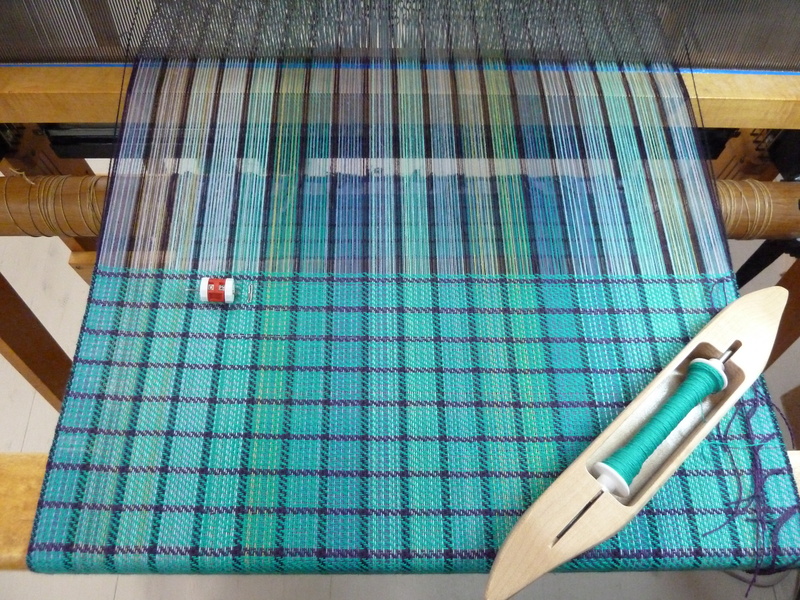 So on Kingston the new loom, I am setting up to do a series of “collapse weave” scarves – they will be very colorful. The thin stripes in warp and weft are fine merino wool, the rest cotton. When I wash them vigorously the wool should shrink and felt more than the cotton, to get a textured surface. The first one is an experiment… in a day or two I should know how it turns out before moving on to the next ones.